If you’re a fan of saganaki, Apollo is your heaven on earth! 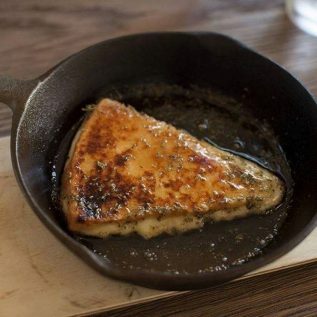 Perfectly fried and flambéed cheese is seasoned with honey and oregano and served in the traditional saganaki pan. You’ll taste a version of saganaki you’ve never had before! The restaurant itself adds to the experience. The corner art deco building in Potts Point, has a cavernous, sparse interior with patchy concrete walls and large arched windows letting in plenty of light. It feels like a modern Greek taverna – elegant and rustic at the same time, with food to match.